There are messages all around you: accidental and intentional modes of communication imprinted in everyday reality. On the northern edge of Hsinchu City 新竹市, about halfway between Nanliao Fishing Port 南寮漁港 and the massive Hsinchu Air Base 新竹空軍基地, you’ll find a small restaurant by the name of Old Lu Beef Noodles 老陸牛肉麵. Such a shop might not catch your eye were it not for a curious turquoise signboard perched on an easel out front. Hsinchu 新竹 is home to one of the highest densities of military dependents’ villages in the nation (including one right next door) so it comes as no surprise that it would be advertising military village cuisine 眷村美食. 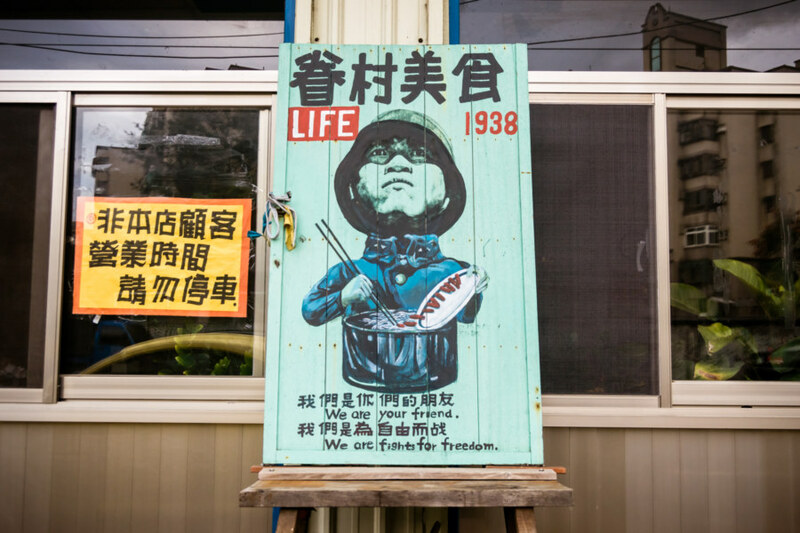 What is rather unusual is the hand-painted adaptation of the May 16, 1938, edition of Life Magazine, originally subtitled A Defender of China, appearing here with the messages We are your friend 我們的你們的朋友 and We are fights for freedom 我們是為自由而战 (with that last character a simplified form of 戰). The pot of noodles and chopsticks are a creative addition. 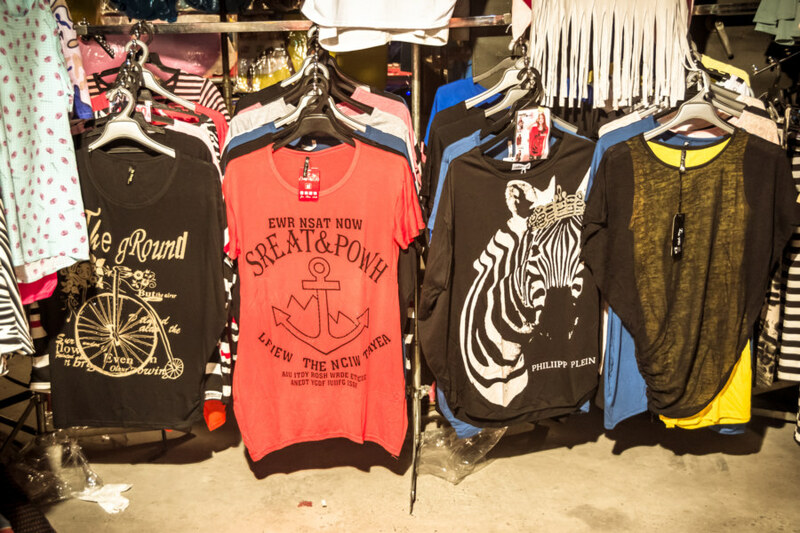 In addition to their reputation for novelty foods night markets in Taiwan also offer an almost endless variety of cheap goods, particularly clothing and accessories. Much of Taiwanese night market fashion is amusing, quirky, provocative, bizarre, or even incoherent, though some of it is also quite clever. 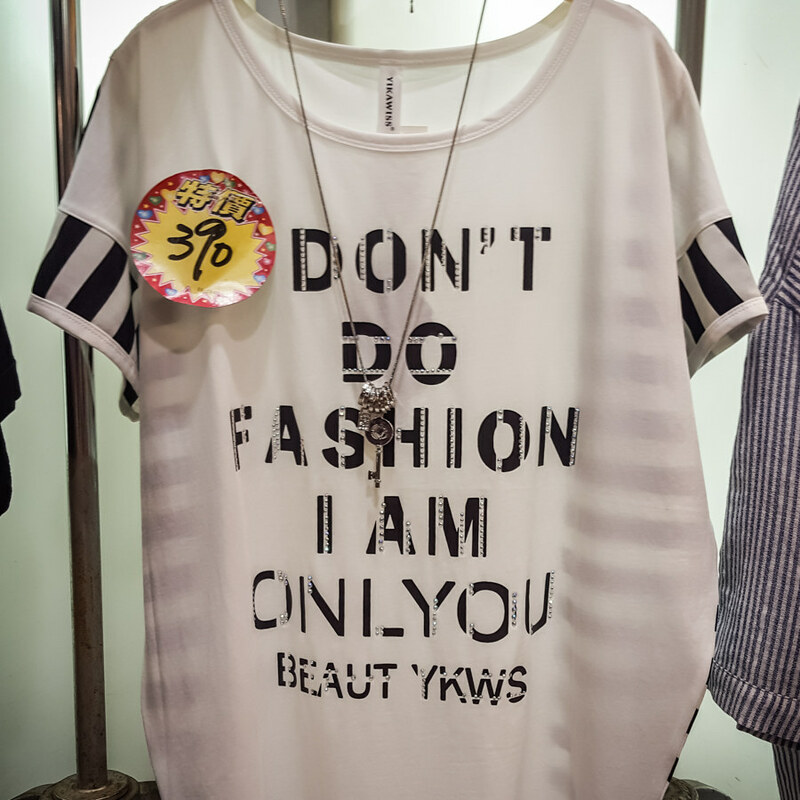 My understanding is that a lot of the weirder stuff originates in China, where massive factories churn out garments emblazoned with English text and pop culture references without regard for semantic meaning. 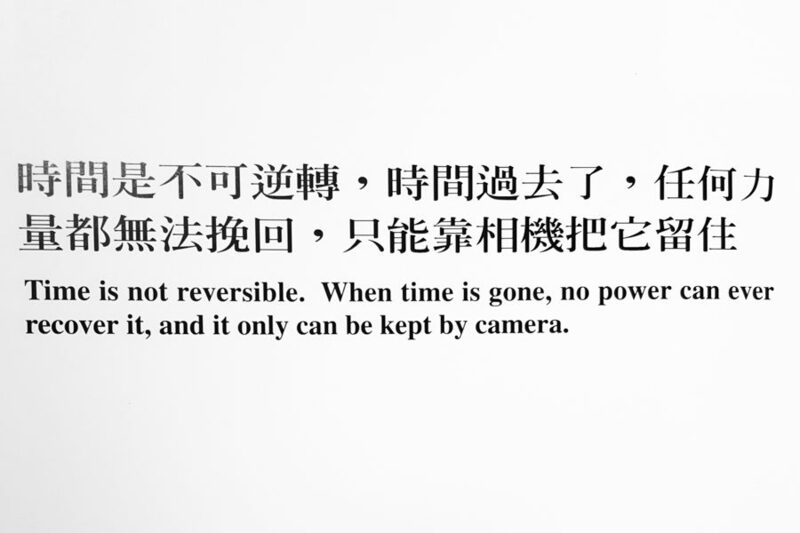 This is almost certainly the result of copying passages from print or online media, using machine translation, or sheer laziness, but it might also be for aesthetic effect. Transcription errors are common, particularly when popular designs are copied by competing factories. Observed on the scale of years there is something almost evolutionary at work in night market fashion—styles mutate and are subject to a kind of natural selection. To celebrate the absurdity of this curious cultural phenomena I have assembled about 40 photos from my many visits to the night markets of Taiwan, almost all of which I have previously been shared on my Instagram account, the perfect vehicle for such inanity. Enjoy! 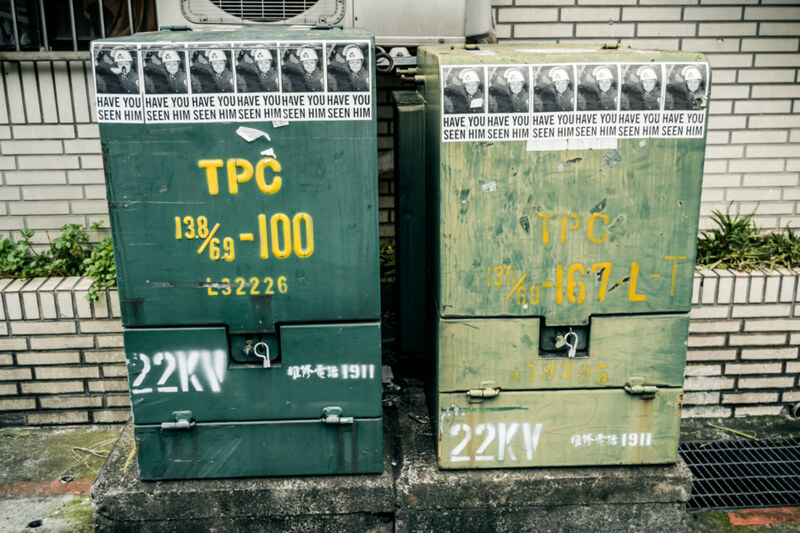 Today I wandered by the former American embassy, now the Spot Taipei Film House 光點台北電影院 in Zhōngshān District 中山區, and noticed this series of stickers on the electrical transformers across the lane. In bold lettering it says: HAVE YOU SEEN HIM. I wondered what it meant—and it seems I’m not the only one. Turns out the man in the photograph was one of the police officers involved in evicting people from the Executive Yuan 行政院 in the early mornings hours of March 24th, 2014, during the Sunflower Student Movement. He was caught on camera beating protesters and, when student leaders demanded the police identify the officer, they initially claimed to not know his name or whereabouts. Later it was revealed that the officer was not even relieved of duty in the aftermath of that violent night. 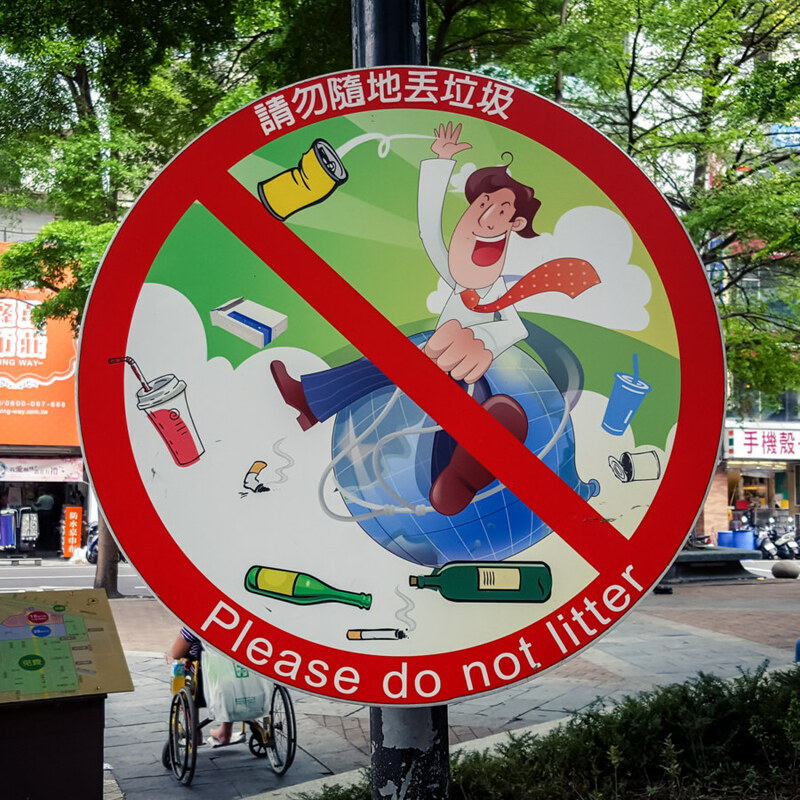 I was amused to notice this unusually large anti-littering sign in central Taichung 台中 the other day. White men are occasionally portrayed as villains in public service announcements here in Taiwan—see here and here for two examples from this blog—but seldom with as much absurdity. I mean, just look at how few fucks are given by this business cowboy, lasso in hand as he throws trash everywhere while riding, inexplicably, a balloon version of planet Earth, with cigarettes, wine bottles, tin cans, and other refuse strewn all over the place. Yee-haw! A friend joked that this is basically how she imagines most white men—and indeed, this is basically me, all of the time. I spotted this t-shirt in the front window of a shop in the enormous Fengjia Night Market 逢甲夜市 in Taichung 台中. 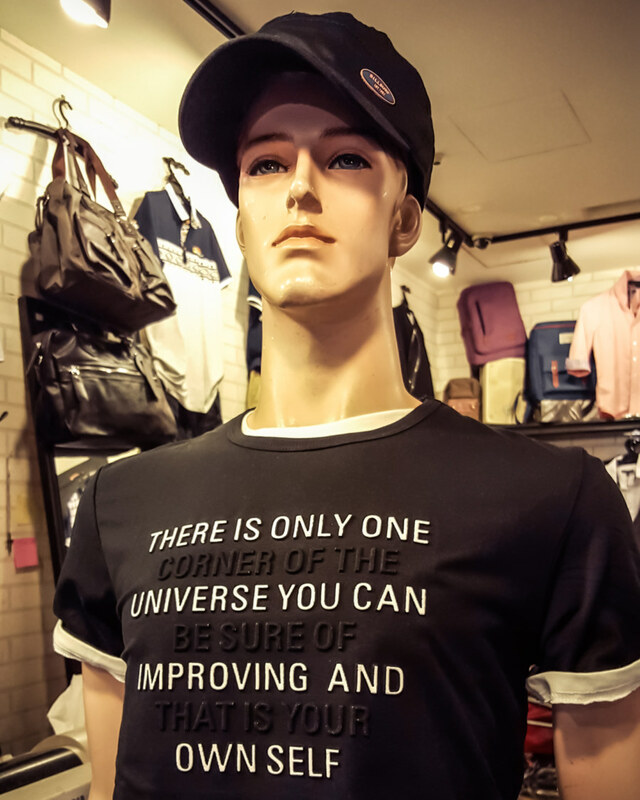 At first glance it appears to be the usual gibberish—but a closer look reveals a surprisingly profound message: There is only one corner of the universe you can be sure of improving and that is your own self. I was amused to notice this public service announcement posted in the front window of what I would assume is a community police station in Bǎnqiáo 板桥. I wonder what compelled them to write out “love or punishment” in English? The target audience is obviously local. Below the main banner the text reads: jinqian & shijian 金錢 & 時間 (time and money), dou yinggai liu gei piaoliang nuyou 都應該留給漂亮女友 (all should be left to the beautiful girlfriend). In case it isn’t obvious by now, this is an admonition to not engage in the services of prostitutes, which is technically illegal in Taiwan (but seldom enforced). Yesterday I dropped in for brunch at a quirky diner in Taichung 台中 known as Lucky Southeast Asian Dining Hall 金福氣南洋食堂. The decor is decidedly pan-Asian kitsch, with all manner of recognizable icons appearing on signs and posters around the shop. 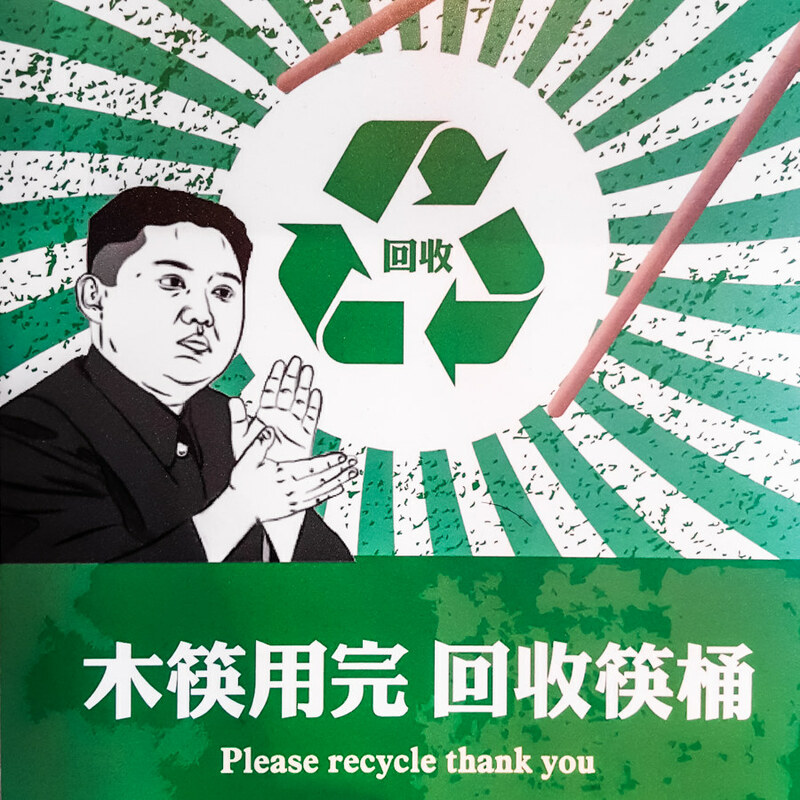 This particular graphic features a cartoon version of Kim Jong-un, supreme leader of North Korea, imploring guests to recycle chopsticks. Hey, at least it’s not Hitler! The visual symmetry of this parking garage entrance between two residential buildings in Sōngshān District 松山區 caught my eye earlier today. A closer look reveals a message on the passageway to and from the subterranean domain. On the left: kuaikuai lele chumen 快快樂樂出門, something like “happily go out”; and on the right: an’an huijia 安安回家, return home in peace. I spent about an hour in the library at Shih Chien University 實踐大學 in Taipei 台北 not so long ago. Among tomes unshelved and perused was Chieu-Feng: The Mountainous Town 山城九份, a collection of photographs by Wong Ting-Hua 翁庭華 documenting everyday life in Jiǔfèn 九份 over the course of four decades. This quotation immediately jumped out at me. It succinctly articulates one of the main reasons I do what I do (in terms of photography and blogging). I am similarly concerned with documenting the prosaic, everyday moments, the sort of things that most people overlook. Photography allows us to explore the past, to consider what happened from a different perspective, in a different light. All these scenes vanish the instant they are captured. This wall runs along the perimeter of the army’s Technical Training Center 技訓中心 in Xìnyì District 信義區. 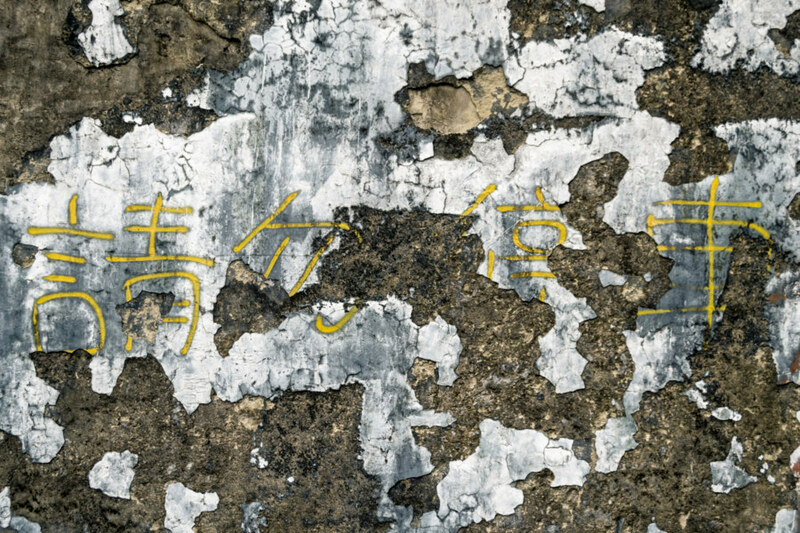 I had just finished scoping out the Stanton Club and was on my way to Hexing Coal Mine 和興炭坑 when the rhythm of cracked paint and weathered concrete caught my eye. 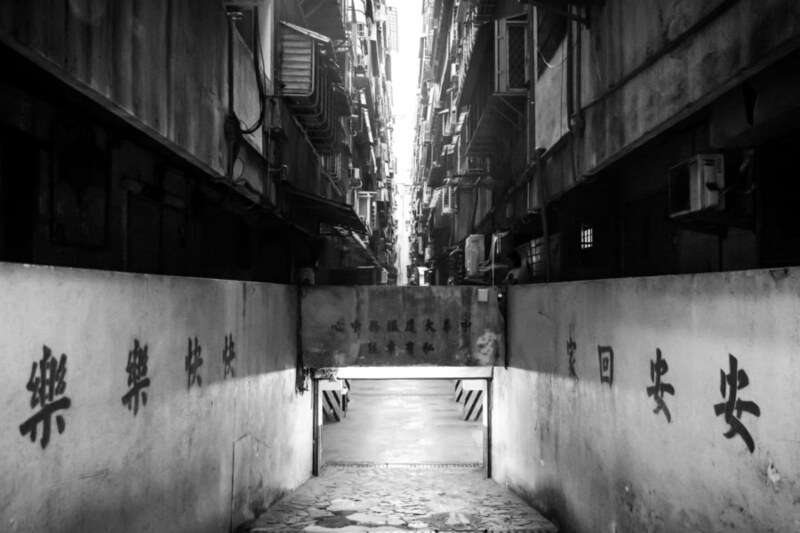 Even an admonition as mundane as “no parking” (qingwu tingche 請勿停車) becomes oddly beautiful in time.